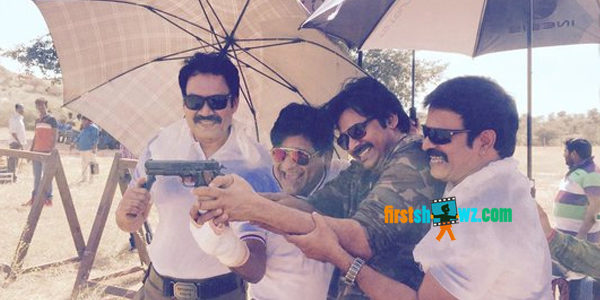 Power Star Pawan Kalyan's upcoming action entertainer Sardaar Gabbar Singh shoot is progressing at a rapid pace, and around 60% of the film’s shoot has been completed. Currently, the unit members are filming an action sequence on Pawan Kalyan and goons in an erected Ratanpur village set, and it will be wrapped in a couple of more days. Kajal Aggarwal is pairing up with Pawan Kalyan in Sardaar Gabbar Singh, being directed by KS Ravindra aka Bobby. The entire shoot will be wrapped up by mid-March, and post production formalities meanwhile will begin, while the makers are planning to release the movie on April 8. Produced on Pawan Kalyan Creative Works and Sharrath Marar’s North Star Entertainments, SGS has DSP as the music composer.